Detectives are appealing for information about a car they believe was used in a shooting in the Springburn area of Glasgow on Saturday. The red Audi Quattro was later found burned-out in the visitor centre car park at Muirshiel Country Park, Lochwinnoch, the day after the attack. Officers have confirmed the registration of the car they believe to be involved is MJ14 ZFM. The man, 29, who was shot is in serious but stable condition in hospital. A police spokesman previously said officers were called at about 11:15 after gunshots were heard. They now believe two men in the Audi approached the victim, who was a passenger in a van when he was shot. 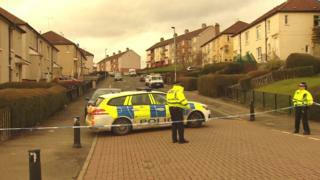 The incident happened in Dykemuir Street, the same street where a 26-year-old man was shot in March last year. Det Insp Jim Bradley, from Police Scotland said: "We are now carrying out forensic inquiries on the burned-out vehicle we have recovered. However, we are appealing for information regarding its movements between Dykemuir Street and Muirshiel Country Park. "The car would have been set on fire between 16:00 on Saturday and 11:30 am on Sunday, it is a distinctive car with chrome wing mirrors and chrome surround on the windows." He said officers were trying to establish the car's movements between Glasgow and the Lochwinnoch area - particularly in Craigenbay Street, Dykemuir Street, Wallacewell Road or Muirshiel Country Park - and asked the public to come forward if they had any information.